Bloemfontein (; [ˈblumfɔntəi̯n]; Afrikaans and Dutch previously "fountain of flowers" or "blooming fountain;" also known as Bloem) is the capital city of the province of Free State of South Africa; and, as the judicial capital of the nation, one of South Africa's three national capitals (the other two being Cape Town, the legislative capital, and Pretoria, the administrative capital). Bloemfontein is the sixth largest city in South Africa. Bloemfontein was popularly and poetically known as "the city of roses", owing to the abundance of these flowers and the annual rose festival held there. The city's Sesotho name is Mangaung, meaning "place of cheetahs". Bloemfontein has since 2011 formed part of the Mangaung Metropolitan Municipality, having previously been part of the Mangaung Local Municipality. Bloemfontein is situated at an altitude of 1,395 m (4,577 ft) above sea level. The city is home to 369,568 residents, while the Mangaung Metropolitan Municipality has a population of 645,455. 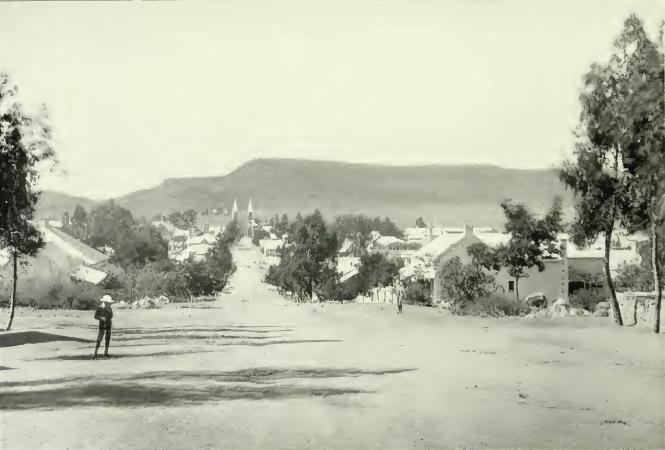 Though historically a predominantly Afrikaner settlement, Bloemfontein was officially founded in 1846 as a fort by British army major Henry Douglas Warden as a British outpost in the Transoranje region, at that stage occupied by various groups of peoples including Cape Colony Trek Boers, Griqua and Basotho. Although modern day Bloemfontein has a reputation for its flowers in an otherwise arid region, the origin of the city's name is unclear. Popular legends include an ox named "Bloem" owned by one of the pioneer farmers that was taken by a lion near a fountain on his property, while another story names Jan Bloem (1775–1858), a Korana KhoiKhoi leader who inhabited the area. Bloemfontein literally means fountain of flowers or flower spring in Dutch. With colonial policy shifts, the region changed into the Orange River Sovereignty (1848–54) and eventually the Orange Free State Republic (1854–1902). From 1902–10 it served as the capital of the Orange River Colony and since that time as the provincial capital of the Free State. In 1910 it became the Judicial capital of the Union of South Africa. Warden originally chose the site largely because of its proximity to the main route to Winburg, the spacious open country, and the absence of horse sickness. Bloemfontein was the original farm of Johannes Nicolaas Brits born 21 February 1790, owner and first inhabitant of Bloemfontein. Johann – as he was known – sold the farm to Maj Warden. As the capital of the Orange Free State Republic the growth and maturing of the Republic resulted in the growth of the town. Numerous public buildings that remain in use today were constructed. This was largely facilitated by the excellent governance of the Republic (which acquired the term model republic) and the compensation from the British for the loss of the diamond rich Griqualand area.. The old Orange Free State's presidential residence the Old Presidency is currently a museum and cultural space in the city. The writer J. R. R. Tolkien was born in the city on 3 January 1892, though his family left South Africa following the death of his father, Arthur Tolkien, while Tolkien was only three. He recorded that his earliest memories were of "a hot country." Until 1994 the city was the sole judicial capital of South Africa. It remains the seat for the Supreme Court Of Appeal (formerly the Appellate Division of the Supreme Court) and is therefore generally regarded as the judicial capital. It is also an administrative center with many private hospitals and educational institutions. Bloemfontein is located in central South Africa on the southern edge of the Highveld at an elevation of 1,400 metres (4,600 ft), bordering on the semi-arid region of the Karoo. The area is generally flat with occasional hills (koppies in Afrikaans) and the general vegetation is Highveld grassland. Bloemfontein experiences a semi-arid climate (Köppen: BSk ), with hot summer days [Jan: max:32 °C (90 °F) min:19 °C (66 °F); frequent afternoon thunderstorms] and cooler, dry winters, often with frosts [July: max:14 °C (57 °F) min:−3 °C (27 °F)]. Snow is uncommon but as recently as August 2006 it snowed in the city, with snowfalls occurring again at the airport on 26 July 2007. Bloemfontein is joint home (together with nearby Botshabelo) to Premier Soccer League team Bloemfontein Celtic. Some of the matches of the 2010 FIFA World Cup were played at the Free State Stadium, including the historic 4–1 defeat of England by Germany in the round of 16. Bloemfontein's Free State Stadium is home to two rugby union teams; the Cheetahs who compete in Super Rugby and the Free State Cheetahs who play in the domestic Currie Cup. The Free State Cheetahs won the Currie Cup in 2005 against the Blue Bulls, they drew the final with the Blue Bulls in 2006 and retained the Currie Cup title in 2007 by beating the Golden Lions resulting in the Cheetahs remaining Currie Cup champions until 2008 when the failed to make the final for the first time since 2004. 2009 saw the Cheetahs return to the Currie Cup final but they were unable to beat the Blue Bulls at Loftus Versfeld. In 2016 the Cheetahs won the Currie Cup after a perfect season, beating the Blue Bulls at home in Bloemfontein. One of the most active soaring communities in South Africa and the world is using the New Tempe Airport north of Bloemfontein. Bloemfontein has two rock climbing clubs each with a wall and boulder cave. Every year Bloemfontein, the 'City of Roses' celebrates the 'Bloemfontein Rose Festival', also known as the 'Mangaung Rose Festival', in October. The event takes place in October because the roses in the Free State bloom best during this cooler month. The majority of the events happen at the Loch Logan Waterfront in Bloemfontein. The festival attracts visitors and rose enthusiasts from all over South Africa and the world to participate and experience this grand showcase of roses and other local events and attractions, which take place throughout the city. The festival has made Bloemfontein a popular destination for visitors from around the world as thousands of people attend the festival annually. The first rose festival first took place in 1976, when council members decided that hosting such a festival was appropriate given the area's name. In 1976 the events spanned over a few days and included activities related to roses in the Sanlam Plaza. Since then, the rose festival has expanded and grown to meet the growing needs and interests of the public. Horticulturalists are invited to take part in competitions which focus on designing and improving unkempt gardens around the city. Festival activities take place in private gardens all over Bloemfontein as local residents of the city open their gardens to the general public for viewing. The bulk of the festival happens at the Loch Logan Waterfront, which is the largest shopping centre in central South Africa. It spans about 80 000 m² of space and is the hub of shopping, entertainment, sport and culture in Bloemfontein. The waterfront displays flowers created by local nursaries as well as the official municipal display created by the parks department, which is organised by the Mangaung Municipality. The Free State Rose Society’s champion Rose Cut Competition, with approximately 700 entrants every year, is also hosted at the Waterfront, along with the Miss Volksblad Rosebud competition for girls aged 3–4 years old, organised in conjunction with the Volksblad daily newspaper. This expo forms part of the Mangaung/Bloemfontein Rose Festival and gives 'green' and organic local businesses an opportunity to display their businesses. This includes showcasing different products and services that support a green environment, such as solar power, grey water systems, vegetable tunnels, JoJo tank systems, etc. Bloemfontein offers many institutions of learning, from pre-schools to Universities and colleges. Classes are taught in different schools in different languages, some schools even teaching all classes in two languages. These languages are mostly Afrikaans, English or Sesotho. Last year in October the Mangaung Metropolitan and various taxi associations reached an agreement on the Integrated Public Transport system which is currently under construction. The project consist of two phases, the first phase will see the construction of bus ways along the Metropolitan. The second will be the building of depot and stations.